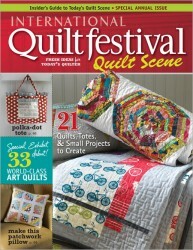 This is the third annual special issue from Quilting Arts Magazine and Quilts, Inc., packed with 148 pages of feature articles, projects, and beautiful photography celebrating the best in contemporary quilting. I love the fabric panel shower curtain, which will show off your fabric dyeing/surface decoration techniques! (and could be made as a wall-hanging instead). I'm also tempted to make some of the quirky fabric owls for Christmas presents.